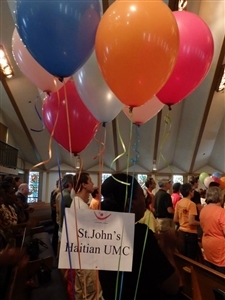 Celebrate Jesus mission volunteers gather at St. John's Haitian UMC with a goal of taking the gospel to neighbors. Photos from Celebrate Jesus. GOLDENROD – Living up to the United Methodist slogan “open doors” is a noteworthy achievement for a church, but opening hearts and minds to Jesus might mean the neighbors’ doors are even more important. Celebrate Jesus, a nonprofit, ecumenical ministry with Methodist roots, helps church members learn how to knock on the doors of homes and businesses with offers of prayer and invitations of fellowship. Cookies and small gifts can’t hurt either, said Martha Gay Duncan, the ministry’s executive director. Since 1999, the ministry has been teaching the art of outreach, organizing weeklong missions where participants ages 5 and older from throughout Florida gather at a host church and learn how to take Jesus’ teachings to homes and businesses. Most missions take place in the summer. The next information session, called Explore Celebrate Jesus, will be held from 10 to 11:30 a.m. Saturday, Aug. 17, at Jacksonville Baptist Association, 2700 University Blvd., Jacksonville. Another is planned for the Tampa area at First UMC, Lutz, 960 W. Lutz Lake Fern Road, from 7 to 8:30 p.m. Tuesday, Aug. 20. The deadline for committing to be a host church for next summer’s missions is Sept. 10. Mission events generally include sending teams of people into a community to invite people to a block party at the host church at the end of the week, Duncan said. The teams can be divided according to age or family relationships but typically include at least one person familiar with the local community. As part of the party invitation, volunteers hand out small gifts, often with the name and contact information of the local church on them. Then they ask if there’s a specific prayer request they can fulfill, either right there with the neighbor or later when they return to church. That’s often the hardest part of the experience for participants, Duncan said. “The first time I did it, I was very much a skeptic,” she recalled. But whenever the groups pray for the mission as they start working on a new street, they have been well-received, she said. Dozens of churches may send one or more people to a Celebrate Jesus mission, and it’s not unusual for participants to visit 2,500 to 5,000 homes and businesses during a mission week, she said. The block party typically attracts around 2,000. The host church usually offers food, music and games for kids. Martha Gay Duncan helps kick off a Celebrate Jesus mission this summer. 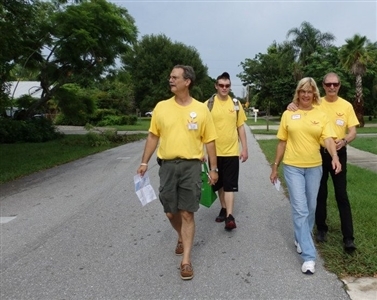 Celebrate Jesus mission volunteers take to the streets to meet neighbors in Stuart. For newcomers who attend the block party, the key is to pair them with someone in the church of similar interests; for example, a single mother would be introduced to another single mother. Duncan remembered one mission in Sun City Center in which a volunteer approached someone in the publishing business and thanked the person for providing service to the community. She said the businessperson cried and said no one had ever said thank you in 25 years of working there. In New Smyrna, mission team members approached the owner of a new dog-boarding business who asked them to pray there on the spot for the business’ success. As they were praying, two new customers came in. 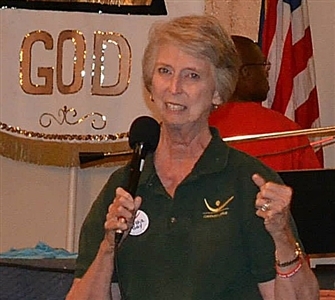 Janet Earls, Congregational Vitality specialist for the Florida Conference, attended a mission at First UMC, Stuart, one of two host churches that participated in the Celebrate Jesus Treasure Coast mission July 27 to Aug. 3. The other host church was St. John’s Haitian UMC, Boynton Beach. Earls said the Celebrate Jesus outreach approach is a valuable tool to help congregations remain vital to their communities. “I was in the park [in Stuart] as the team served a free lunch, hot dogs, chips, a cookie, and water to anyone who came by,” Earls said by email. Earlier in the summer, Celebrate Jesus organized mission teams at Community UMC, Belle Glade, and First UMC, Pahokee. Celebrate Jesus is funded through participation fees and donations. For information about the ministry, visit www.cjmission.org.